Where to Buy Carton Boxes for Moving in Melbourne? A well organised move requires the best moving equipment and supplies. In Melbourne, Dawson Moving & Storage sell quality packing supplies at cheap prices so that your valuables can be safely transported locally or interstate. When you are looking to buy moving boxes in Melbourne, it is best to create a rough list of your inventory. This list will help you determine how many carton boxes and porta-robes you will need for packing purposes. A professional moving company who supplies packing equipment will be able to recommend a suitable number of moving boxes for you. Dawson Moving & Storage have over 40 years of industry experience in Melbourne and nationwide, and can easily assist you with adequate packing supplies. It is important to keep in mind that carton moving boxes should only be used once for heavy and valuable goods. Second-hand moving boxes are ideal for linen, toys and general items. Buying new carton boxes for moving in Melbourne will be a sure way to keep your items protected. When buying moving boxes in Melbourne, you may need a few other packing supplies including tape, labels, packing paper and bubble wrap to secure glassware, crockery and other fragile items. It is always best to ‘over-protect’ when packing to avoid damage of precious goods. 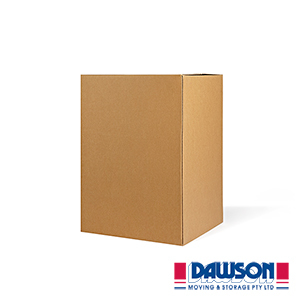 Dawson Moving & Storage offers cheap deals on packing equipment and boxes. In addition, Dawson Moving & Storage also offer a valet packing service by a professional packing team. The expert packers will bring all the necessary packing equipment and carton boxes to get your home or office ready for the big move in Melbourne.